Residents evicted in 2016 celebrate Civil Administration go-ahead to repopulate Hebron. 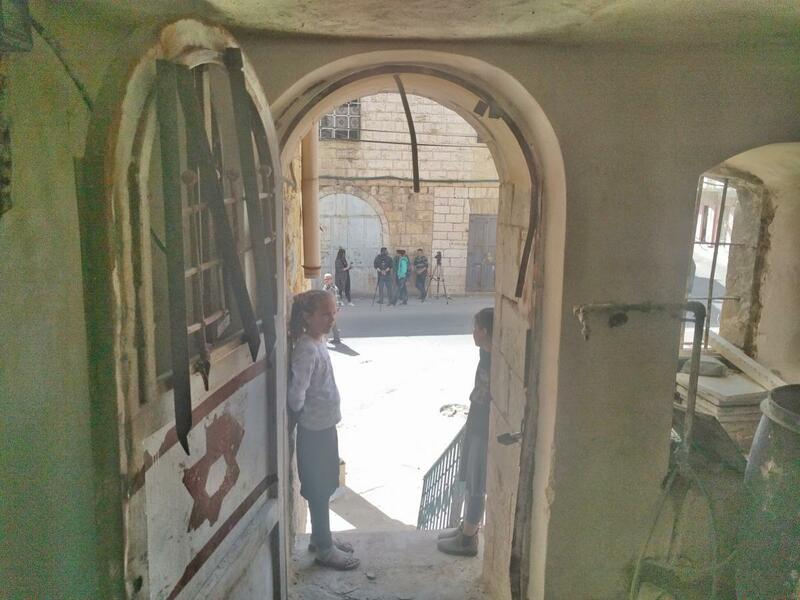 Two apartments in Hebron made front page headlines this week as Jewish residents returned to Beit Rachel and Beit Leah. The adjacent buildings located on King David Street near the Tomb of Machpela sat empty for years before being purchased by Jewish residents. In 2016 families moved in only to be evicted by Israeli authorities days later. On Tuesday March 27, 2018, the families returned and held a housewarming ceremony including the placement of a traditional mezuzah on the doorpost. Local and international news outlets covered the event with the Jerusalem Post giving it front-page placement with the title "Seder like it's '68" a reference to the 1968 Passover seder which initiated the repatriation to Hebron following Israel's Six Day War. ברוך מציב גבול אלמנה. בשעה טובה ולאחר דרך רצופת מכשולים ניתן 'היתר העיסקה' לרכישת בית רחל ולאה, סמוך למערת המכפלה. ברגעים אלו ממש נכנסות משפחות יהודיות להתגורר במקום. שהחיינו וקיימנו והגיענו לזמן הזה! Unfortunately the families that moved did so because they were forced to vacate the Beit HaMachpela building, another Jewish property in question. Unlike pre-1967 Israel, those living in Judea and Samaria must obtain extra zoning permits and have all deeds ratified by the Defense Minister. In addition, the authorities can also demand special permission to actually populate properties even after sales have been verified. These extra permits are complicated by arguments from Palestinian Authority residents who deny that properties have been sold. This is done so because the PA opposes a Jewish presence in Judea and Samaria. Selling land to Jews is a crime punishable by death. In the case of Beit HaMachpela, the property was purchased in 2012 and populated only to have the Jewish residents evicted. It was repopulated in 2017 after the Appeals Committee again determined in favor of the Jewish purchasers. But in 2018, new legal claims forced the residents to move again. The Palestinian Authority resident who arranged the sale of the property, Muhammad Abu Shahala, was arrested for the crime of selling land to Jews. He was sentenced to death, but since his arrest, have still been in prison. The Jewish Community of Hebron sent a petition to the United Nations pleading for a stay of execution. In the case of Beit Rachel and Beit Leah, the homes were purchased in 2012 according to Hebron resident Shlomo Levinger, of the Harhivi Makom Ohalech organization which conducts real estate purchases in Judea and Samaria. He stated that his organization received authorization from defense officials to enter the buildings. “On this day, the people of Israel have taken an historic step to redeem the land,” Levinger said. He recalled that it was on Passover, exactly 50 years ago, that his father, Rabbi Moshe Levinger headed the Passover seder that led to the return to Hebron. “In the face of all the challenges and those who are trying to derail our continued expansion in the city of our forefathers, we declare that on this day, all of Israel is taking a historic step in redeeming the land,” the organization said in a prèss release. Other properties that have been contested in Hebron have been the Shalhevet neighborhood which was purchased by the Jewish community in the 1800s, but lost during the 1929 Hebron Massacre. Although courts ruled the land belonged to the Jewish community, the Jordanian structures built later, could not be used. The Beit HaShalom building too was contested by Arab owners who later recanted and denied selling the property to Jews. As a result, in Jewish occupants being forcibly evicted in 2008. The Jewishc ommunity later released video footage of the monetary transaction.